For more than 80 years, the Avon company has been selling personal care and beauty products, jewelry, and other fine items, often packaging their products in collectible glassware. The glassware packaging and the products themselves are very popular with collectors, and there are several sources that specialize in these collectibles. Whether you're interested in the glassware or vintage Avon products, you'll find a number of these items at local antique shops and flea markets. However, if you're looking for the best selection, the Internet is your best shopping resource. The Glass Menagerie specializes in glass Avon containers of all types and eras. Prices range from about $10 to $70, depending on the rarity of the glassware and the era in which it was made. There are many items from the 1960s through the 1980s. Specializing in a variety of Avon collectible glassware and original products, FindAvon.com has plenty of great items to choose from. You'll find dolls, Cape Cod ruby glass, figurines, and collectible plates as well, all made by the Avon company. Prices are affordable, and most items cost less than $30. Vintage Treasures A to Z has a more limited selection of Avon collectibles, but it's still worth checking out for the quality of the items. There are a number of glassware and china collectibles, as well as Avon beauty products in mint condition and with their original packaging. Prices range depending on the item, but most pieces are less than $60. Offering everything from Christmas ornaments to jewelry by Avon, the Avon Collectible Shop is another great shopping resource. You'll find items priced as low as six dollars, as well as more valuable pieces to add to your Avon collection. 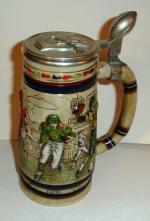 Perhaps one of the best sources for Avon glassware and collectible items is eBay. With thousands of vintage and antique Avon items, you'll have to be specific about what you want to find. However, you'll have great luck finding items that may be more challenging to locate in other stores. In the mid 1960s, Avon began producing novelty containers for perfumes. The first glass car decanter, introduced in 1968, was an instant hit and is still one of their most popular collectibles today. Collectors loved the new products, and Avon began creating more collectibles to charm their fans. Most of the collectibles are not particularly valuable; their value is in the joy they give to those that collect them. Every collector is different and will have a favorite item to collect. Christmas decorations and several Avon perfume containers are the most popular items to collect. 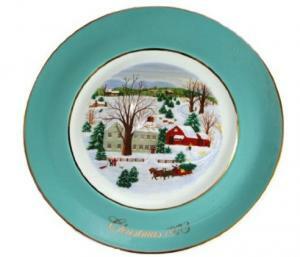 The first Avon Christmas plate was issued in 1973 and entitled Christmas on the Farm. It has a robin's egg blue band around the outside, and the center is a primitive illustration of a farm. Like every Avon collector's plate, the date is written on the band. Avon has issued a new Christmas plate every year since and along the way has added other collectible and commemorative plates. The plates are quite reasonably priced. Even the first collector's plate produced can be purchased for under $50.00. Check the plates for cracks, repairs, chips, and faded paint. Try to get those that come with the original box intact as these are more valuable than plates without the original box. 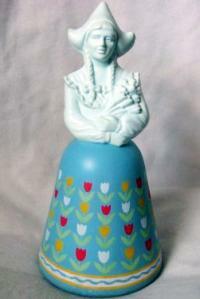 Avon figurines are favored by many collectors. Mrs. Albee figurines are particularly difficult to find because they are awards given to Avon representatives and not released to the general public. Other favorites are the Scarlett O'Hara and annual Christmas figurines. Many collectors begin collecting Avon with fragrances. People tend to collect the special issue fragrance bottles such as the glass cars and animals. Collectors also enjoy fragrance bottles that are unique because the fragrance was available for a limited time. Although Avon collectibles tend to be affordable, it's still a good idea to know as much as you can about this market. That way, you can avoid buying a fake or wasting your money on a product that isn't priced competitively. All collectible products that have been developed by Avon will carry the Avon Fine Collectibles logo. Sometimes the company partners with other brands like Cherished Teddies or Precious Moments. These items will not be marked with the Avon logo even though they have been exclusively created for Avon. Generally, if they are in the original packaging, the item will have wording that says something to the effect of exclusively created for Avon. If you don't see the item marked with the Avon logo, think twice about your purchase. As with many collectible items, the original package can dramatically enhance the value of Avon collectibles. These items command a higher price on the secondary market if the collector keeps the box they came in. Keep in mind that items in their original packaging with the certificate of authenticity, if there was one, will be worth far more than collectibles that have lost their boxes. Before you buy or sell a piece of Avon glassware or another collectible item, you should get a thorough understanding of the value. Although original packaging and the condition of the piece are important, the biggest factor that drives the price of these items is the demand. If no one is collecting your item, then it isn't worth as much. To find out the value of your piece, examine the wares at various Avon shops, and then look at recently sold items on eBay. You'll find out whether these pieces are selling and the amount that collectors paid for them. A particularly helpful book on this topic is Bud Hastin's Avon Collector's Encyclopedia, which includes information about and values for a number of collectible pieces. You can also speak with an antique appraiser online or in person for the best sense of a piece's value. If you would like to find out more about Avon collectibles, the National Association of Avon Collectors is a great place to start. This organization has chapters all over the United States as well as abroad. The chapters often have monthly meetings and there is also a yearly convention held for all members. You can also connect with other collectors through ICollectAvon and Avon Collectors. Avon products and packaging offer a wealth of collecting opportunities, especially since most items are affordable for the average collector. Research the type of collectible that interests you, and be on the lookout for your next great piece.